Henry René Albert Guy de Maupassant gilt neben Balzac, Flaubert und Zola als einer der großen französischen Erzähler des 19. Jahrhunderts. Der Durchbruch als Autor gelang ihm 1880 mit der meisterhaften psychologischen Novelle „Boule de suif”. In den nächsten zwölf Jahren schrieb er mit rasch wachsendem Prestige und Einkommen vor allem erzählende Werke. Sein Leben blieb unruhig: Er hatte wechselnde Geliebte, unternahm lange Reisen unter anderem nach Nordafrika, wohnte in der Normandie, in Cannes und Antibe. 1893 starb er in einer psychiatrischen Klinik an den Folgen einer Syphilis-Erkrankung. Join us for a book club to discuss some of the world's most important literary classics. Are you up for a challenge? Then join Level 3 staff as they moderate discussions of works including War and Peace by Leo Tolstoy, Homer's Odyssey, Cousin Bette by Balzac, and a final title to be announced. Registration required in person beginning Saturday, December 8th at the Level 3 Information Desk. Call 604-331-3738 for more information. The Salon Classics Book Group meets at 7:30 p.m. to discuss Eugenie Grandet by Honore de Balzac. Oakland - The Seated Diesels discuss Honore De Balzac's "Old Man Goriot"
Diesel, A Bookstore in Oakland welcomes The Seated Diesels (formerly Book Group #1) back to the store to discuss Honore De Balzac's Old Man Goriot on Tuesday, April 17th at 7pm. In this newly-translated masterpiece of fiction, an ambitious young man named Eugene has just arrived in Paris, where the streets teem with chancers, criminals, and social climbers. When he takes a room at a shabby boarding house, he sees a potential fortune in two beautiful, aristocratic women who visit the lonely old lodger Goriot. Could they bring Eugene the status and acceptance he craves? Honoré de Balzac, The Unknown Masterpiece. Honoré de Balzac, Old Goriot. Honoré de Balzac is currently considered a "single author." If one or more works are by a distinct, homonymous authors, go ahead and split the author. 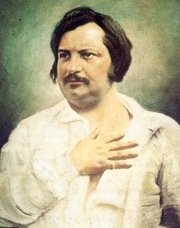 Honoré de Balzac is composed of 57 names. You can examine and separate out names.